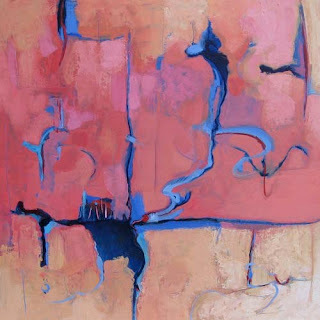 Angela Baker’s recent works in oil are, “inspired in part by text. Written words are used as the catalyst for the biomorphic forms.” The artist notes the expressive brushwork and automatic writing in the works of Willem DeKooning and the contemporary artist Julie Mehretu as inspirations. Mark Faigenbaum’s works in college make use of, “materials that reflect the passage of time. Brittle newsprint yellowed paper, crumbling photographs or dated technical drawings are layered or taken apart and reconstructed.” His pieces invoke a sense of mystery and memory.